Veterans Day is on Tuesday November 11th this year. This day is to celebrate all veterans and active duty military who are protecting us so we can have freedom! Veterans Day is largely intended to thank living veterans for dedicated and loyal service to their country. November 11 of each year is the day that we ensure veterans know that we deeply appreciate the sacrifices they have made in the lives to keep our country free. This year, many businesses are thanking our active duty military and veterans with free meals and other free stuff! 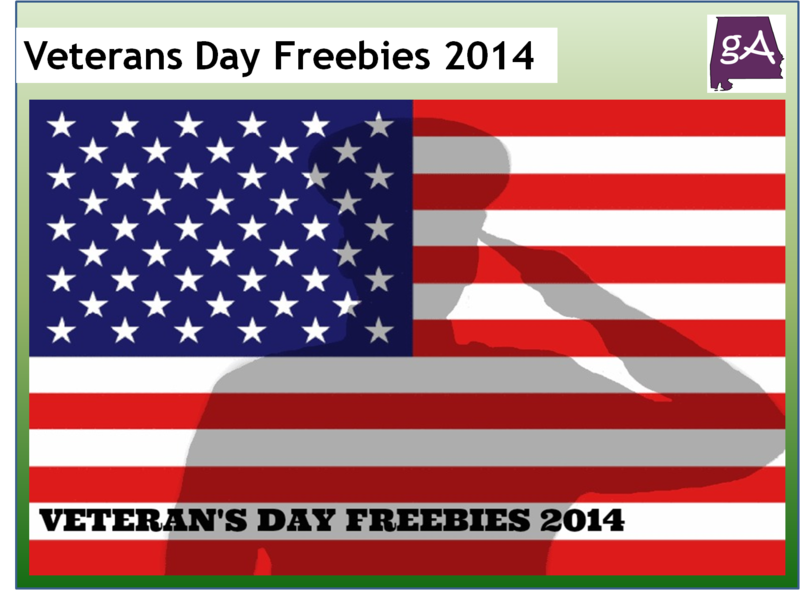 This post is going to highlight several businesses in Alabama who are celebrating Veterans Day with freebies. Applebee’s: Give veterans and active duty military can choose from a free signature Thank You Meal menu that includes some of Applebee’s favorite items, including a 7 oz. House Sirloin, American Standard All-In Burger, Three-Cheese Chicken Penne, Fiesta Lime Chicken, Double Crunch Shrimp, Chicken Tenders Platter or Oriental Chicken Salad. Must present valid Veteran’s form of identification or be in uniform. Golden Corral: Monday November 17th from 5 PM to 9 PM get a free Veterans Day buffet and beverage to any veteran who has served in the United States military or is a current active duty service member. All Golden Corral locations will be participating. No identification is required to get your free Veterans day meal. California Pizza Kitchen: On Monday November 11, all veterans or active duty military personnel will be able to get an entree from their special menu for free (dine-in only). Please come in uniform or bring your military ID or other proof of service. Cracker Barrel: All veterans will get a free double chocolate fudge Coca-Cola cake dessert. Hooters: Tuesday, Nov. 11, Hooters invites all veterans and current servicemen and women to a free meal, up to $10.99 in value with any drink purchase, by presenting a military ID or proof of service at any Hooters location across the country. On the Border: Veterans and active duty military can enjoy a free meal from the “Create Your Own Combo menu” on Tuesday, November 11. Bob Evans: Veterans and active military personnel will receive free all–you-can-eat hotcakes at its restaurants on Veterans Day, Monday, November 11. All these honored servicemen and women need do is show a valid military ID. Chili’s: Veterans and active-duty military receive a free meal from a special Veterans Day menu on Tuesday Nov. 11th. Must show proof of military service. Denny’s: Active, inactive and retired military personnel get a free Build Your Own Grand Slam on Tuesday, November 11, from 5 am to noon at participating locations. Red Robin: Enjoy a free Red’s Tavern Double burger with Bottomless Steak Fries at participating restaurants nationwide. Longhorn Steakhouse: A complimentary Texas Tonion appetizer and non-alcoholic drink to service members on Veterans Day. O’ Charley’s: On Tuesday, November 11 all veterans and all active-duty military personnel will have their choice of one of nine meals on the O’Charley’s “$9.99er” menu. Cheeseburger in Paradise: Active and retired military personnel receive a complimentary All-American Burger with fries on Tuesday, November 11. Olive Garden: On Nov. 11, service members can received a complimentary entrée from a special menu. Outback Steakhouse: Military personnel and veterans get a Free Bloomin’ Onion and a beverage. Must have valid identification. Plus, get 15% off all meals from Nov. 12 through Dec. 31. Red Lobster: The restaurant is offering a free appetizer to servicemen and women from Nov. 10-13. Texas Roadhouse: Free lunch from 11:00 a.m. to 2 p.m.
TGI Fridays: Fridays is providing lunch to vets and active duty military from 11 am to 2 pm on Veterans Day. Shoney’s: Shoney’s says ‘Thank You’ to America’s heroes by offering Shoney’s All-American Burger to All Veterans and Active Duty Military Members on Tuesday, November 11th. Krystal: Active and retired military receive a free Krystal Sausage Biscuit from 6 AM to 10:30 AM on Tuesday, November 11. Lone Star Steakhouse: On Tuesday, November 11, active duty, reserve and retired service members get a free appetizer. Marco’s Pizza: Free medium, 1-topping pizza for veterans and active military personnel with ID on Nov. 11. Starbucks: This Veterans Day veterans, active duty military and their spouses get a free tall brewed coffee at participating U.S. company-owned stores. Alabama State Parks: They will waive the entrance fee for veterans at all of its 22 state parks November 8-11 2014. Anyone who indicates they are a veteran will be admitted into the park day-use areas without charge. No identification will be required. U.S. Army Corps of Engineers: Will wave all day use fees for veterans, active and reserve component service members, and their families at the more than 2,400 USACE-operated recreation areas nationwide on Veterans Day November 11. Subway: Free Six Inch Sub, November 11, 2013. Select SUBWAY® Restaurants will offer a FREE six-inch sub or flatbread to military veterans on Veterans Day. This offer is valid only on November 11, 2013 at participating local SUBWAY® restaurants, Military ID or proof of service required. Great Clips: Free haircuts to all veterans and active duty veterans on Tuesday November 11th. Plus get a card to pass a free haircut along to another US veteran. Sonny’s BBQ: All veterans will receive 50% off their meals. US National Parks: All veterans and active duty military can take advantage of an Entrance-Free Day at over 100 participating National Parks on November 11th! Dollar General: All veterans and active duty will get 11% off entire purchase on Tuesday November 11th. Carrabba’s: All active and retired veterans get a free appetizer November 8 through 11. Chuck E. Cheese’s: Veterans and active duty military get 20 free tokens from November 9 through November 15. Chick-fil-A: Offering free meals to all veterans and those in active duty, and identification is required. Not all locations participating, call ahead! Bed, Bath & Beyond: Offering all veterans and active duty veterans a 20% off your entire purchase – in-store only form November 10th through November 11th. All you need to do is show ID. World Market: From November 8th-11th, Active Duty Military and Veterans can snag 20% off your entire purchase. Firestone Complete Auto Care: Between November 9 and 16, veterans and active duty personnel receive an additional 10 percent off the lowest advertised price of any automotive service. The Home Depot: Home Depot offers a 10 percent discount to all veterans on Veterans Day November 11. Home Depot offers the 10 percent discount year round to for active duty and retirees. Lowe’s: All veterans receive a 10 percent discount on Veterans Day, November 11. The offer is available in stores only. Publix: Active and retired military personnel and their families get a 10 percent discount on Tuesday, November 11. Rack Room Shoes: Military personnel and their dependents get a 10 percent discount off entire purchase on Veteran’s Day, November 11. Sport Clips: Free haircuts to the Military and former military on Nov. 11th. Not all stores are participating so be sure to call ahead. Travel Centers of America: On Tuesday, November 11, all CDL drivers who are military veterans eat free at participating full-service restaurants. 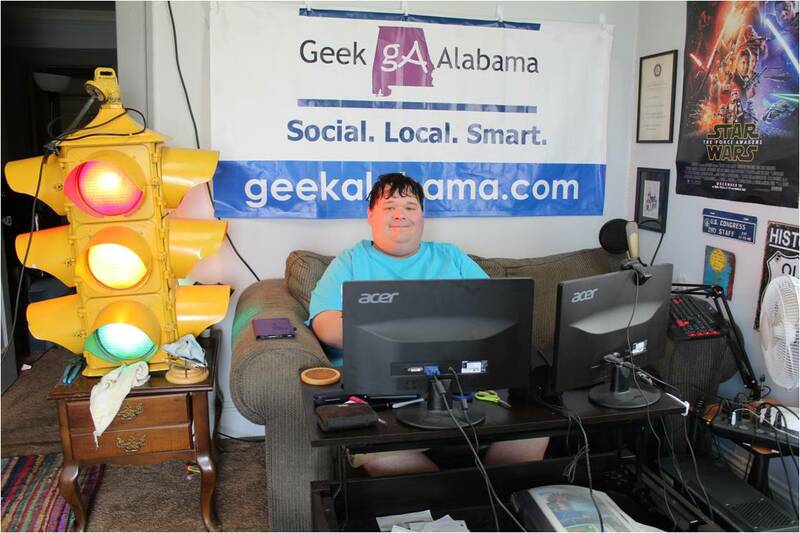 Many small businesses across Alabama are also giving free services to all active duty military and veterans. Just ask to see if they are participating! STARBUCKS is also giving a free tall coffee.